Aside from contributing to the production of The Collected Works of Jeremy Bentham, a further aim of Transcribe Bentham is to increase user access to and participation with the Bentham Papers. We intend to have digitised around 12,500 manuscript images which will be made available through UCL’s Digital Collections. At the time of writing, nine boxes worth of Bentham material have been uploaded and more will be progressively added. 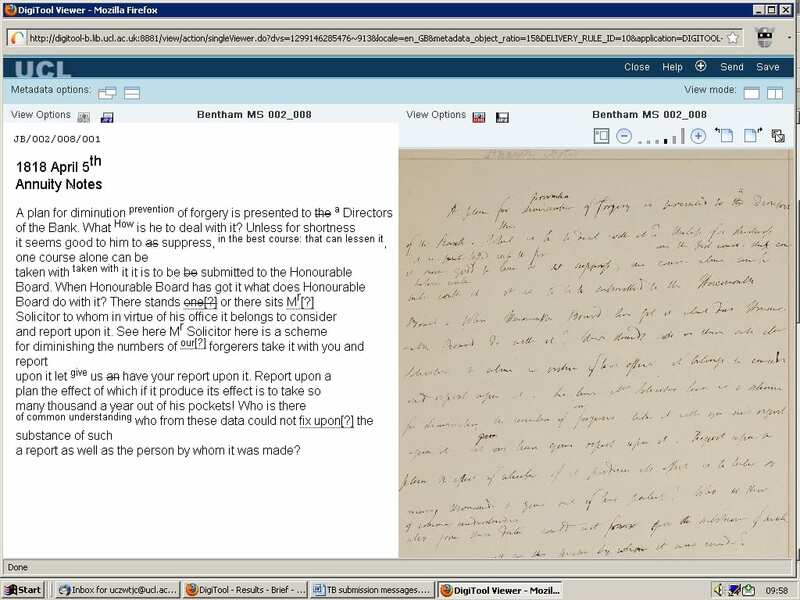 Transcripts produced by Transcribe Bentham will also be added to the collection alongside the relevant manuscript images, with the aim of producing a full-text searchable archive of the Bentham Papers which we hope will prove an invaluable resource for students, the general public and researchers alike. Transcripts generated by Transcribe Bentham users of material from Boxes 2, 27, 70, and 95 have recently been added to the collection and are now available to view. Users of the resource need to scroll down or select a manuscript beside which there is a red ‘XML’ icon, such as beside MS/002/008 in this image; this icon signifies that a transcript has been uploaded and clicking it will display it. Users might wish to see the transcript alongside the manuscript image, which can be done by first clicking the ‘side-by-side’ view icon in the top-right of the screen. This will initially bring up a second version of the transcript, so click the blue ‘JPG’ icon above the second transcript, followed by the ‘full view’ icon to display the transcript and image correctly. More images and transcripts will be added to the digital collection in the forthcoming weeks and months. 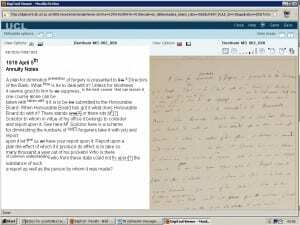 We are hugely grateful to Transcribe Bentham users for providing these transcripts, and hope you enjoy seeing the fruits of your labours preserved and made available for everyone in this way. Users can have a look for themselves here. (Thanks too to UCL’s Digital Curation team for uploading the transcripts). It sounds wonderful! Looking forward to seeing the finished products. Thanks Diane! You can see the digital collection here (http://digitool-b.lib.ucl.ac.uk:8881/R/?func=collections&collection_id=1867), just look out for the manuscripts with the ‘XML’ icon next to them. Terrific stuff! Really good to see this up, running and working. It is such a boon for users to be able to see their work in its final electronic destination. Kudos all round. I’ve been checking them out Tim … wow, fabulous! What a lovely resource! So thrilled that I’ve spotted some of my transcriptions already uploaded and viewable as XML! Wonderful! It’s lovely to see our work being immortalized and used as a learning resource (hopefully for a few years to come). It will be a very impressive collection by the time it’s finished.